1. Power supply: 380v ( more or less by 5%) 50Hz. 3. Bottle spec(mm): ( diameter) 270 x 490 x( diameter) 56. 4. Bottle volume: 5 gallons. 5. Cap spec: ( diameter) 58 x 40mm. 1. Working pressure of compressed air: not less than 0.6 MPa. 2. Bottle washing capacity: 600 buckets / hour. 3. Bottle filling capacity: 600 buckets / hour. 4. Out size(mm)(L x W x H)(part of washing / part of filling): 3600 x 1420 x 1650 / 3450 x 690 x 1650. 5. 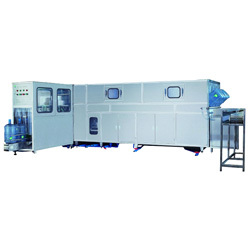 Packing size(mm)(L x W x H)(part of washing / part of filling): 3850 x 1670 x 1900 / 3700 x 940 x 1900. 6. N.W. / G.W. (kg): 1350 /1 650. 7. The direction of bottle output:bottle output with left or right direction, for further details, please contact us.